The Hunger Wall (Hladová zeď in Czech) is a long white medieval city wall, stretching from the Strahov Monastery across Petřín and down the hill to Újezd. It used to serve as part of the southern fortifications of the Lesser Town. The Hunger Wall was built by order of the Holy Roman Emperor and the Czech King Charles IV in 1360 – 1362. 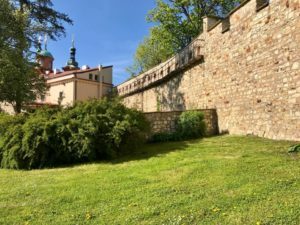 It is said that Charles IV built this wall as a public works project to help the poor in Prague in the time of terrible famine. Poor people working on this structure got food for themselves and their families from the royal storehouses. Old records prove that Czech lands really suffered from great famine in the 1360s, although the main reason for building the wall was probably strategic: Petřín is by far the highest hill in the proximity of the historical center of Prague, therefore if it had fallen under control of the enemy, it would have been a great disadvantage for the defenders of Hradčany and the Lesser Town. Even though there were protection walls built around the Lesser Town by Charles IV’s ancestors, they were too close to the inhabited area. By building the Hunger Wall, Charles IV. strengthened the city protection and enlarged the protected area so that the city could develop. The wall served its defensive purpose for more than 500 years (1362-1848). The Hunger Wall (Hladova zed) has been reconstructed several times, e.g. during the reign of Emperor Ferdinand II, when several bastions were added to the wall, or in the time of Empress Maria Theresa, when a new Baroque fortification was built in the fore-field of the Gothic Hunger Wall. Nowadays about 1200 meters remain from the original length of the wall. It is about 6 meters high and almost 2 meters wide. Its inner walkway is protected by battlements and a platform for marksmen. It is assumed that the wall used to have eight bastions. Notice that the bastion behind the Štefánik Observatory on Petřín Hill offers a nice view of Prague.